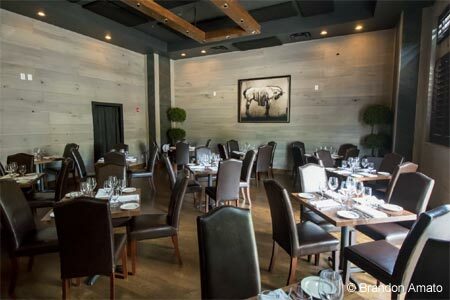 Elegant Vinings steakhouse venture from 101 Concepts. : With longtime Atlanta chef Joe Ahn at the helm as executive chef and partner, this 101 Concepts restaurant has a finely designed environment that relies on rich, dark wood finishes for its visual impact. Seating comprises a busy bar, banquettes and private rooms. To ensure comfortable conversation, head to a large corner banquette or to a table with upholstered chairs in a side space. We like to start with the well-appointed charcuterie and cheese plate, but other hot and cold choices range from roasted marrow bones to caviar. Steak is the name of the game --- go for the bone-in Kansas City strip grilled rare as ordered; however, there are lamb chops (very good) and Georgia's Springer Mountain chicken, a veal chop, pork chop and seafood on squid ink linguine among other fish. Vegetarians need not despair, as the side dishes will compose a vegetarian plate. Desserts vary from rich (New York-style cheesecake) to healthy fresh fruit. Local ice cream maker Honeysuckle gelati are available. Chris Reid's lengthy wine list includes many unusual options, with lots by the glass.